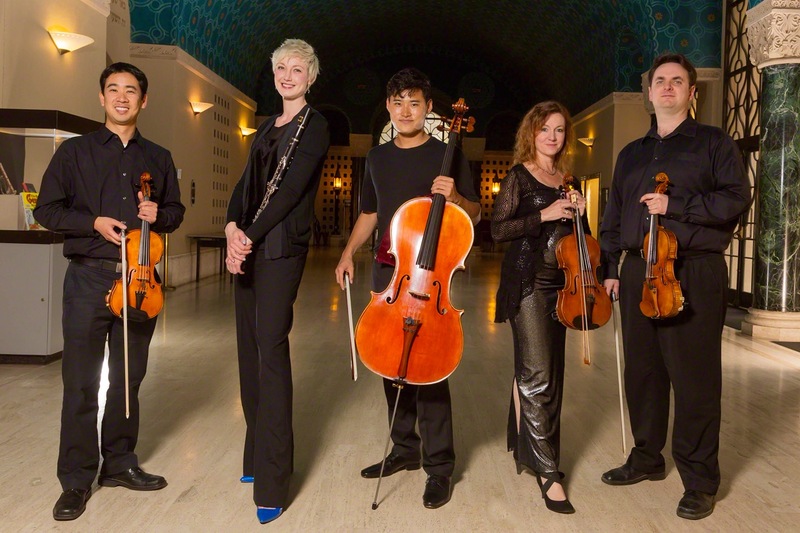 Farallon Quintet, founded in the summer of 2012, is a dynamic Bay Area ensemble and the only professional chamber music group focused exclusively on the repertoire for clarinet quintet—string quartet plus clarinet. In addition to playing the classics, the quintet seeks to perform rarely heard works, innovative arrangements, and new music by living composers. With well over 600 existing clarinet quintets to choose from, the ensemble offers diverse and engaging programs to the general public. In addition to formal concerts, the musicians look for opportunities to present informal educational programs at such venues as schools, hospitals, museums, and retirement communities. To date, the ensemble has commissioned and premiered new works by Chad Cannon, Durwynne Hsieh, Jay Sydeman, Jose Gonzalez Granero, Peter Josheff, and Emily Onderdonk. The quintet is made up of leading Bay Area musicians—Natalie Parker, clarinet; Dan Flanagan and Matthew Oshida, violins; Elizabeth Prior, viola; Jonah Kim, cello—who are principal players in such orchestras as the San Francisco Ballet, Santa Rosa Symphony, Marin Symphony, Berkeley Symphony, Fremont Symphony, Modesto Symphony, and the Sacramento Philharmonic. As a group, the quintet released their debut album Farallon Quintet Originals in 2015, was ensemble-in-residence at Old First Concerts, served on the faculty for Chamber Musicians of Northern California, and received grants from San Francisco Friends of Chamber Music and the Barlow Endowment for Music Composition. Their previous seasons included 50+ performances throughout Northern California, sextet collaborations with pianist Jon Nakamatsu, and several new music commissions. The group takes its name from the Farallon Islands, located right off the coast of San Francisco. In addition to being a landmark location close to where the players live and work, its meaning—“pillar” or “steep rock” in Spanish—indicates the group’s vision to become an important “pillar” or “rock” in classical music by building awareness around the lesser known yet musically significant clarinet quintet repertoire. The Farallon Islands also represent the group’s inspiration which is founded in the simplicity and beauty of nature. In fact, the group is known to intersperse rehearsals with hikes in the mountains and road trips—all with the intent to discover the natural beauties of Northern California.